The distinctive silhouette of Charles Eames' Wire Dining Chair has been bringing elegance to dining rooms since 1951. Not only is the wire shell strong and versatile, but also surprisingly comfortable. The cross-woven frame is carefully shaped to the contours of the back and comes with a fitted cushion upholstered in premium dyed leather. This block of colour creates a stunning contrast with the frame, and will make your interior unforgettable. 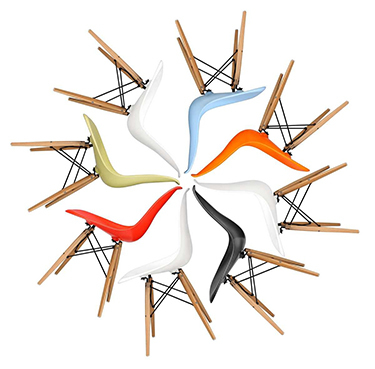 This is an unusual design and a fantastic partner to our entire Eames range. A late-career design from American architect and designer Charles Eames, the 1951 Wire Chair evolved from the Eames' 1948 fibreglass shell chairs. After experimenting with different solid fibreglass bases for the shell, they decided to swap the shell itself for a wire seat, giving the chair an airy, light appearance. The defining 'Eiffel' base borrowed from the DSR Chair remained the same, but the frame was updated with cutting-edge metalwork techniques. Super cool chairs. It took 3 months before I received them in my address, that I was however informed about when ordering because they do not have these special chairs in stock, as they are made to order.